September 17th, 2010 by KTU | Filed under 4. Components and Systems, Park City Mountain Modern. 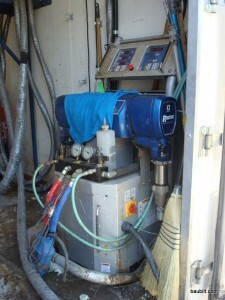 The truck has a pump for feeding the components of the foam down the house. Urethane is a thermosetting polymer, meaning that (like epoxies) it is the result of the mixture of several materials which react to form the foam. 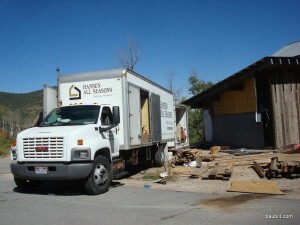 The constituent materials are fed from 55-gallon drums in the truck. This is the end result. 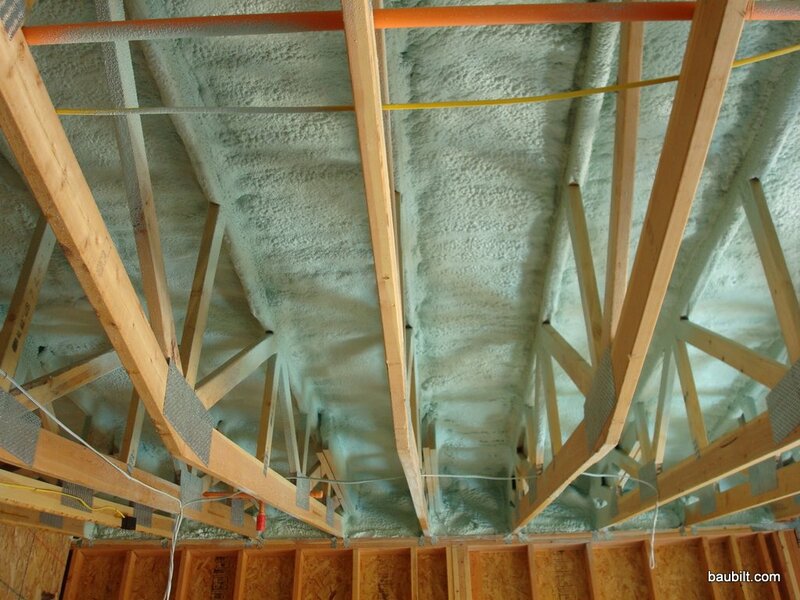 In this case, this is a 4 inch layer of spray foam applied to the underside of the garage roof. 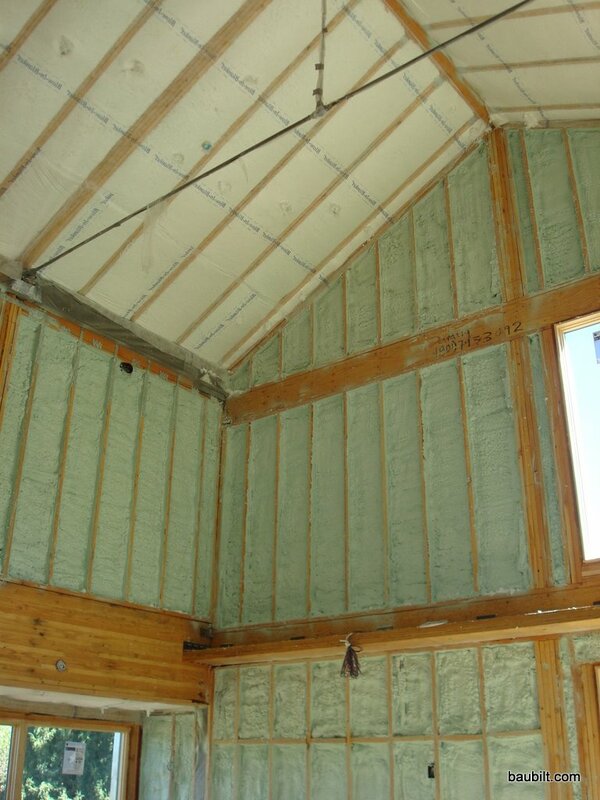 This gives us R-28 in addition to the R-21 that is in the rigid foam panels applied to the outside of the roof deck. 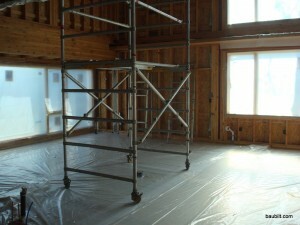 Our guys (Hansen All Seasons) did an excellent job of covering everything with plastic before spraying. 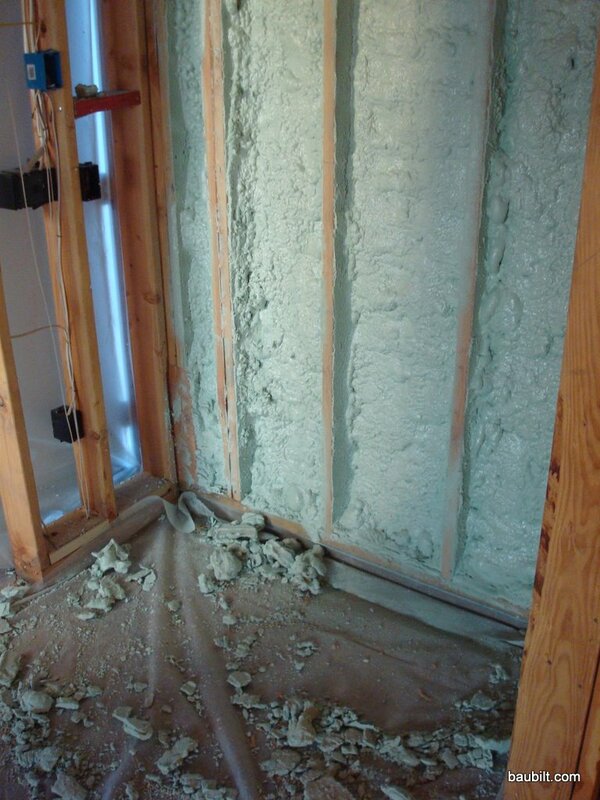 First they spray all the cavities and then they scrape the studs with an ice scraper to ready the structure for the drywall. They roll up the plastic with all the scrapings and haul it away. Here is a finished wall. 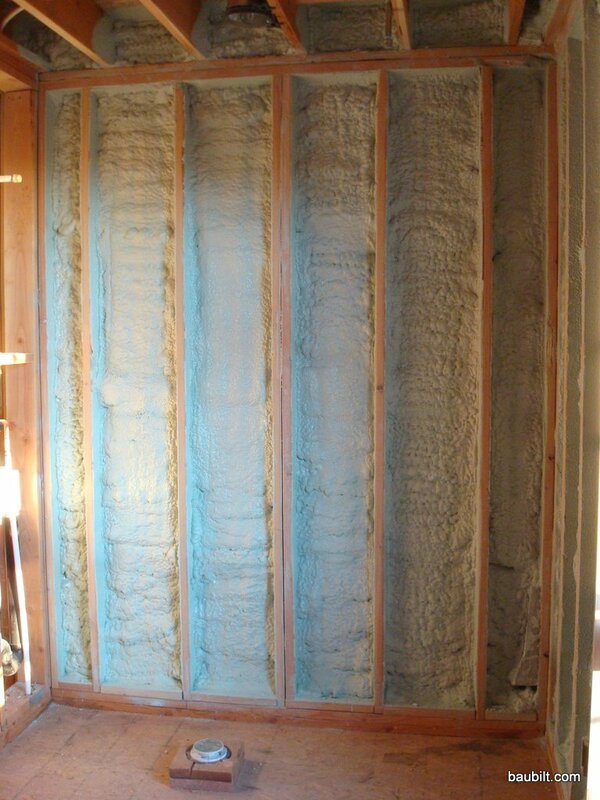 In this case, we sprayed 3 inches (R-20) in the walls and then leave it just like this. 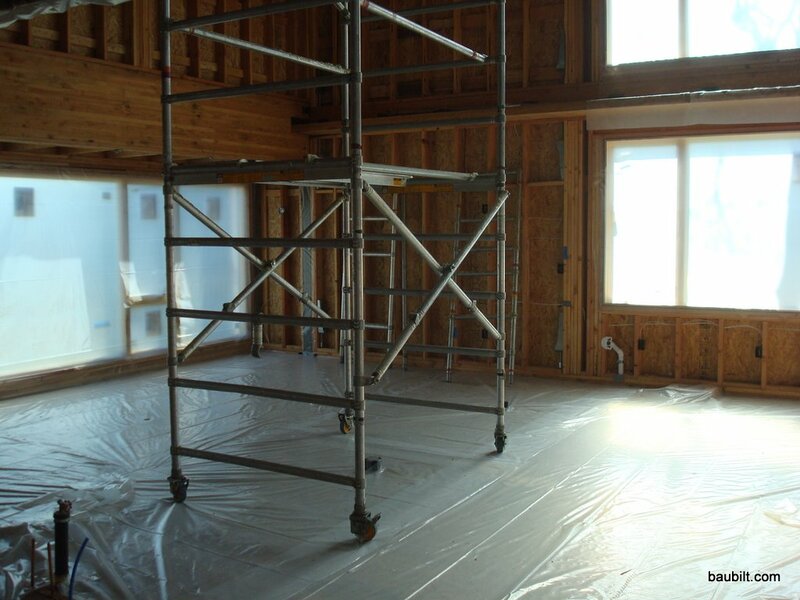 No vapor barrier is needed and no further insulation is needed. They also fill all the gaps and penetrations around the windows with a hand spray tool (essentially the commercial version of Great Stuff foam). Here’s an update after completion. 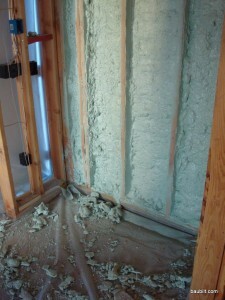 The next step after spraying in the foam is to fill some of the cavities with “BIBS” (blown in blanket). 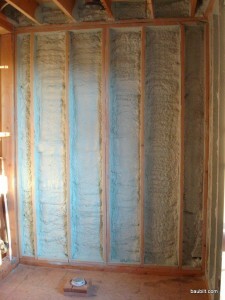 BIBS are the white fluff (fiberglass) shown in the photos behind a breathable sheet that is stapled to the walls and ceiling. We did this only in the rafter bays. 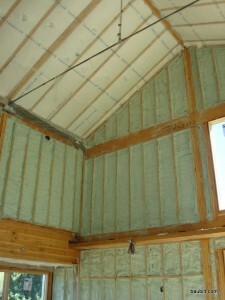 We also used BIBs only in the garage walls, as it is very economical. 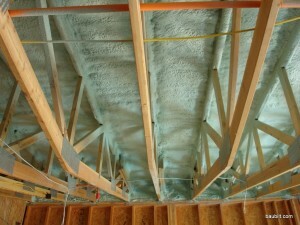 BIBS system visible in roof, with spray foam on walls.